While you’ve been able to spend several days with no responsibilities there’s nothing like directions on how to disembark the ship to bring you back to reality. 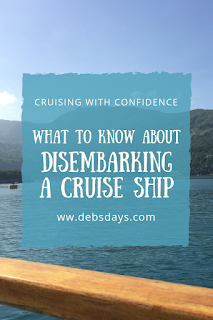 A day or so before the end of the cruise you will receive information about the disembarkation process. All accounts must be settled before leaving the ship. If a credit card has been left on file there is no need to check out as you would in a hotel. Cash or check accounts may require a visit to the passenger services desk the evening before departure to settle up. In some cases any beverage purchases on that last morning will have to be paid in cash because the account has already been closed out. On other ships cruise cards may be used for purchases up until the moment you are scanned off the ship. The same day you are getting off the ship the next set of passengers will be getting on. Before anyone can leave, the ship has to wait for clearance from local authorities and customs officials. Sometimes customs are ahead of schedule and sometimes they are behind. Be ready to be flexible. Because getting everyone off the ship at the same time is as impossible as boarding everyone at the same time, passengers are assigned disembarkation times. 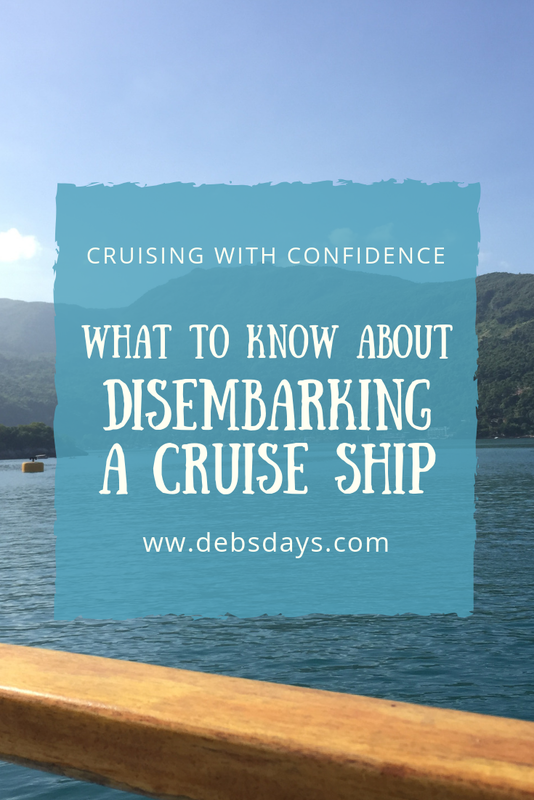 The assigned time is dependent on flights, post-cruise tours, and whether the cruise line will be delivering your luggage to the cruise terminal or if you are carrying off your own bags. The cabin stewards start prepping cabins for the new passengers right away. Most likely you will be required to leave the cabin earlier than the time you are scheduled to leave the ship. For example, you may be asked to be out of the cabin by 8:00 a.m. yet not scheduled to leave the ship until 9:45 a.m.
You may be assigned a meeting place to wait at until your disembarkation time. We prefer to wait in a quiet spot, usually by the pool, and then go to the assigned lounge a few minutes before our scheduled time. Why rush, having your mind already racing back home when you can sit in the warm sunshine on a lounge chair, squeezing in another hour of vacation time? Usually room service isn’t available the last morning and the buffet can be super-busy with everyone eating at about the same time. There have been occasions when we ordered cereal and fruit from room service the day before and saved the food to eat on that last morning. Beats the craziness found in the breakfast locations on disembarkation day. The procedure for getting your luggage off the ship is different than any you may have experienced before. You are assigned color-coded luggage tags that control the flow of passengers off the ship and assist you in finding your luggage within the cruise terminal. Attach the provided luggage tags to your bags and place the bags outside the cabin door on the last evening of the cruise. Crew collect luggage from hallways all throughout the night and organize it based on the tag's color. You will not see your bags again until the next morning in the terminal. Keep your carry-on with you. Be sure to have the obvious items like medications and passports in the carry-on, but don't forget the clothes you'll be wearing the next day. Don’t be caught in pjs because you forgot to pack clothes to wear off the ship! Take everything out of the safe and leave it open. Hold onto your cruise card because you will need it for one last scanning off the ship. When you collect your luggage in the terminal it usually will not be on a carousel like at the airport but placed side by side grouped by the luggage tag color. There may be several hundred bags in your luggage tag group so double check the bag carefully before leaving with it. There are porters available in the area for passengers needing luggage assistance. If you can manage all your luggage on your own you may have the option to take it off the ship yourself. For those driving home from the port or with an early morning flight this walk-off disembarkation can usually get you on your way earlier. But if you plan on carrying all your luggage off the ship, think very carefully about the logistics of it. Multiple large suitcases and carry-ons being dragged down a carpeted hall. Fitting into super-busy elevators. Finding a place to keep suitcases during breakfast. Rolling those suitcases up or down the gangway. Down another even busier and slower elevator in the terminal. Are you nimble and fit and patient enough? Are your travel companions? When returning to the United States passengers report to Customs and Border Protection in the cruise terminal where passports are presented to officials. As border security regulations fluctuate other screenings may be instituted. If disembarking in another country additional requirements may exist. Comment cards and online surveys are frequently used by cruise lines to assess the service received. Positive comments are a way for personnel to receive raises and promotions. If someone went out of their way for you, use the comment card to let the cruise line know. Comment cards can be filled out at any time during the cruise with online surveys typically happening post-cruise. Passengers needing wheelchair assistance may be asked to be at the meeting location a few minutes before the assigned departure time. If you think you need this service, use it. Staff will wheel you off the ship, through customs, and to your transportation. My husband frequently uses this service and has been pleased with the attentiveness of staff and speed of the process. ·Pack your patience along with your carry-on. ·Keep medications and documentation with you. ·Remove items from the safe. ·Be out of the cabin when requested. 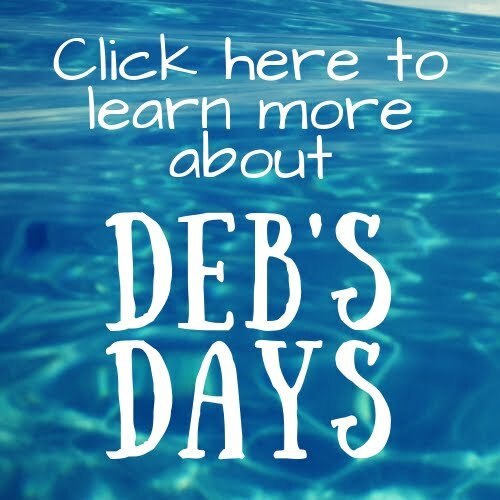 ·Enjoy the last of the cruise ship meals. ·Wait in a nice location before going to the assigned lounge. ·Have your cruise card ready for scanning. ·Collect your luggage in the terminal. ·Have passports ready for customs. ·Be on time for arranged transportation and allow plenty of time to get to the airport. Take one last look at the ship. Are you in for another one? If so, maybe I’ll see you there.